Save 100% on stress with the best chair massage in Phoenix. ** If your event is outside the Phoenix metro area, call for a quote. 1: CONTACT US Fill out the contact form or give us a call at (480) 887-8750 to talk to someone about your needs. Where Can We Bring Chair Massage in Phoenix, AZ? Anywhere! On-site chair massage in Phoenix can be enjoyed in many different ways, and we are so excited to serve you! 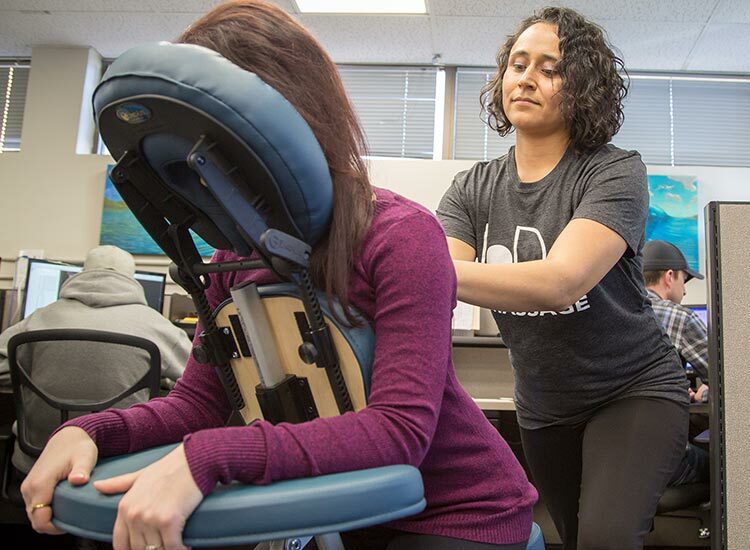 Chair Massage is a great way to promote your business and retail at events in Downtown Phoenix or for the diligent students at the University of Arizona during finals week. 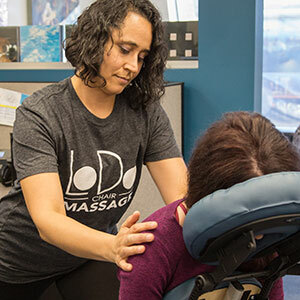 The beloved staples of Downtown Phoenix, the specialty shops of the North End, and the big business of Phoenix can all benefit from the convenience and affordability of on-site massage. 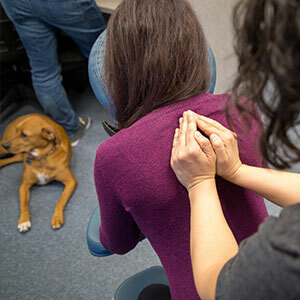 Find out how workplace chair massage or event chair massage can be beneficial to your company today with just a quick phone call to (480) 887-8750. Our therapists are available in the Phoenix, AZ metro area for weekly, biweekly, monthly, or quarterly visits. We also offer package discounts for large events, repeat customers, and referrals. Call for a chair massage at your workplace in Phoenix, AZ. 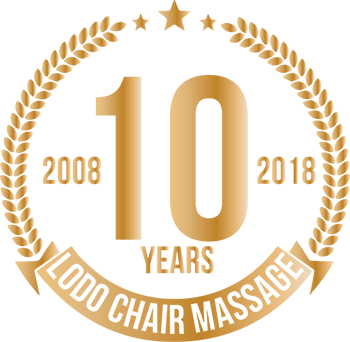 Please reference our client list to see who we've worked with. Bree is an Arizona native and has been a massage therapist since 2006. She grew up dancing and learning how the body moves and heals. Now she is a passionate bodyworker who strives to educate her clients and friends on the power of self-care. 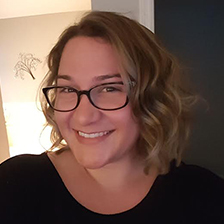 Bree has been through two rounds of 750-hour massage education, that’s a whopping 1,500 hours, the second one earning her Associates Degree in Holistic Health Care. Her favorite modalities include Reflexology, Hot Stone Therapy, Thai massage, Lomi Lomi and Auriculotherapy. She is also a Reiki Master and loves working with energy. However, her biggest love is working with kids, like child athletes, children with Autism, Cerebral Palsy and Cancer. She is a very dedicated mother and believes massage should be integrated into everyone’s lives. 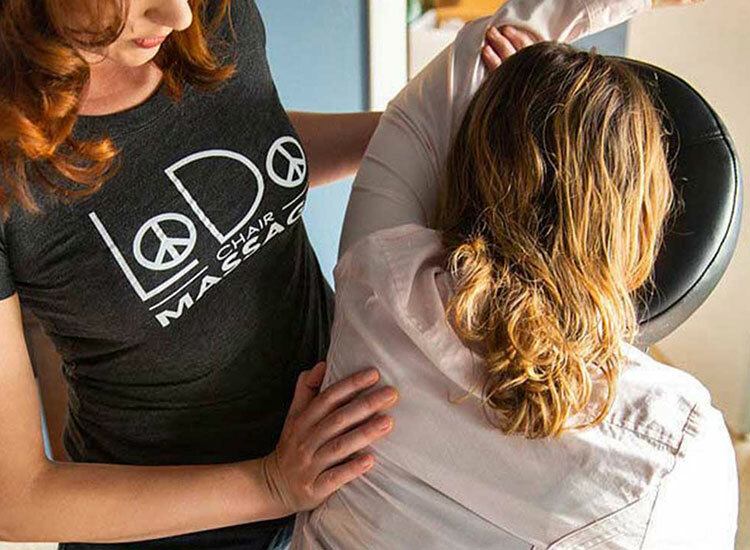 Starting by instilling a positive outlook on touch and developing a healthy self-care plan with children at a very young age, she plans to change the way the world perceives massage, not as a luxury but as a necessity. JoAnn Clinton considers herself a Bodyworker Entrepreneur who is driven by her passion to help others. She spent 20 years in the Field of Information Technology as a Systems Engineer. She holds a Bachelor of Science in Computer Science. In the Information Technology field, she demonstrated precise problem solving abilities. Always wanting to understand and find the most efficient means to help her clients with their pain, JoAnn is able to cultivate her problem solving and intuitive abilities in each session. Growing up, JoAnn has been intrigued with biology. She's been touching bodies and lives since she became a Reiki Master Teacher in 2004. This desire to help others in a profound way led her to an amazing journey to other countries to learn about other wellness-promoting techniques. In her private practice, JoAnn utilizes a myriad of techniques to help her clients. 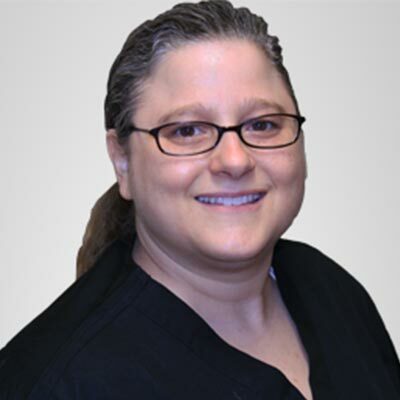 JoAnn is skilled in Neuromuscular, Lymphatic Drainage, Lypossage, Deep Tissue, Sports Massage, Craniosacral Therapy, Reflexology and Visceral Manipulation. JoAnn has since received her Massage License in the State of Arizona and attended numerous Bodywork training classes. She believes in being a life-long learner to make her a better therapist and human being. 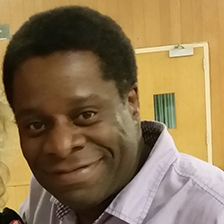 Percy began his journey into the world of massage in 2015 and graduated from Discovery Point School of Massage in Seattle WA in 2016. He was born in Japan and travelled around the world with his family. He calls Pacific Northwest his home for the last 20 years. Percy developed the love of massage many years ago and finally decided to leave his job of 17 years and be a Licensed Massage Therapist. He specializes in Myofacial Release, Swedish and Lomi Lomi, a Hawaiian style relaxation massage modality. Lomi Lomi made him realized how much he enjoys the whole body approach to massage. He still loves to travel and continues to learn different massage techniques and modalities from around the world and incorporate them into his practice.